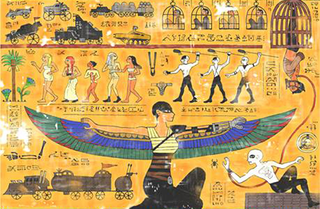 Japanese artist Takumi recreated everything from Mad Max: Fury Road in an ancient Egyptian style, and while the movie has nothing to do with ancient Egypt, it still fits and looks really awesome with this art style. The top pic is only one part of Takumi’s piece. Here’s the complete one below, where all the elements of the movie are featured. Symbolism, hierarchical proportions, and everyone’s head is shown from a profile view, with their bodies from a frontal view. Just like something from a thousands of years old lost tomb. Hope the guys at Ancient Aliens won’t see this! Takumi also shared some black and white drafts. Gotta love those wasteland cars!